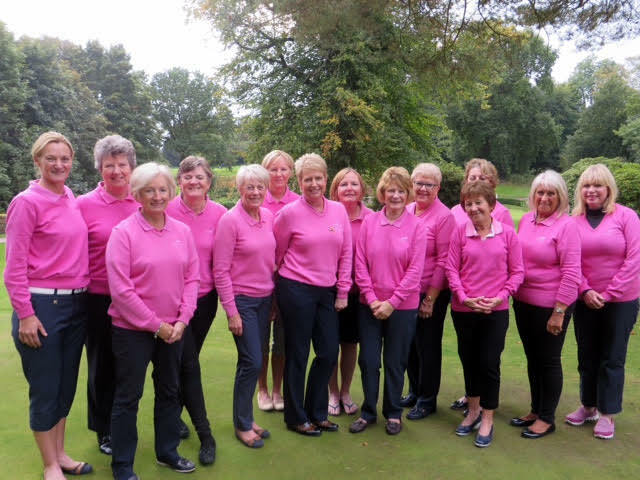 Eighteen ladies had a great day out at Appleby Golf Club on 28th September. Once the low clouds and fog lifted, we had glorious sunshine and the views were fabulous. A fun quirky course and a good day was had by all. Congratulations to Diane Smart who won the Quaich Cup, donated by Sheila Craggs, on a countback from Julie Rose. Congratulations to Elizabeth Wood who had a hole in one at Grantown - on Spey's 16th hole whilst participating in Speyside Golf Festival. Marianne Moore & Lyn Davison and myself have won the Durham County Ladies Thomlinsons Cups for 2018! More success for Brancepeth Ladies! I am delighted to say that Lyn Davison and myself have won the Durham County Ladies Thomlinsons Cups for 2018! This is a Durham County Foursomes competition which started back in 1930.Lyn and I started our journey at Knotty Hill, beating Whickam GC 7/6. We then played at Dinsdale, winning against Eaglescliffe GC, 4/3 then Billingham GC, 5/4. However, yesterday at Seaham GC we had a brilliant day! Brancepeth has won this competition in 1935, 1938, 2006 and now in 2018. As Lady Captain, I cannot express how proud I am to have helped bring these Trophies back to Brancepeth Castle G.C and it is truly special for me to have done so in my Captain's year with my good friend Lyn Davison! Brancepeth Ladies Section have enjoyed a fantastic season this year with all three of their Teams. Our A Team played their last match of the season this afternoon, at home, to Dinsdale and I am delighted to say we won 7 - 0!! This of course, confirms that we are the Anderson Shield winners for 2018. This is the eighth successive year we have won this competition and I am over the moon, not only to win, but for us to repeat last year's performance of being undefeated throughout the season!! I must thank Lyn Davison, our Team Manager and every single lady who has played for us this year. We are very fortunate to have such strength in depth to choose from, in our ladies section. Whenever asked our ladies are there to play for us. Everyone shows an excellent attitude and we have wonderful team spirit, and yes, they can play a bit too! Our B Team have secured their place in Division 2. This is a great achievement as it is always tough for them playing most other club's first teams. The Sivewright Team, which is a handicap team, have won their, South Division, too! They now play George Washington GC, the North Division winners. We are just waiting to be told when and where. We are so lucky and very proud to have, without doubt, the strongest ladies section in Co. Durham. Congratulations to our Men's League Team who are NDUGC Division 1 Champions for the third time. The title was previously won in 1980 and 1986. A big thank you also to all the caddies and supporters. David Parkinson, James Glenn, Stefan Labuschagne, Dom Salmon. Ian Davison, Richard Aisbitt, Jon Gowland, Ally Baird, Jeff Willey. Peter Burdess (Vice-Captain), David Tweddle (Captain), John Heppell, Wayne Melles. Dan Fox, Owen Thomas, Martin Fulbrook, Kevin Kelly. Also "the" Big Match will remain in our Clubhouse for another year. The Ladies of Brancepeth had a brilliant day on Tuesday 17th July for Breast Cancer. £750 was raised, at the last count, thanks to the Ladies who donated food and raffle prizes and to other Members who bought the raffle tickets and there may well be extra to add to the fund over the next couple of days. Congratulations to Linda Larnach, Jean Atkinson and Maureen Wigham who won the Mary Vine Trophy at Durham City on 4th June 2018. Click here to see the latest copy. "the joy of the moment was significantly heightened (if that’s possible) by (a) the fact that Jack was there to witness it and (b) the hugely generous reaction from so many friends at the club. I was genuinely touched". "Tony would like to thank all of our members who sponsored him in raising a fantastic total of £1,115 for the Captains Charity. Tony is photographed with Helen Smurthwaite at St Cuthberts Hospice". Jeff Willey receives Trophy after 6-1 Win against Durham University. The Ladies and Senior Men's Team match took place on Monday April 23rd 2018. This is always a very popular, social day and is enjoyed by everyone. The weather was kind and Senior Captain, Will Cowan did a great job organising the day. The photo below shows the winning team of Elaine Mitchell, Christine Hutchinson, Eric Rix and Jeff Foster. Very well done! Dean Watson & Keith Lownds continued their good form in the Daily Mail Foursomes, winning 4 & 2 at Brancepeth against Woodham, to move forward to the next round. A little disappointing note on which to begin in that, as we write, the weather still remains indifferent at best (it's snowing again!) However much more importantly and looking on the bright side there is still plenty of club matters and golfing issues to reflect upon, notify and report in the latest newsletter. Firstly and hot off the press we must congratulate our Men's Winter League winners James Luke and Vigan Qehaja. Well done guys and thanks to all who participated - you all deserve a medal! Pleasingly we have had club success to report in the 1st round of both the Mens and Ladies 2018 Daily Mail Foursomes with the pairings of Keith Lownds / Dean Watson and Marianne Moore / Helen Morgan progressing after wins over Woodham and Crook respectively - again well done and good luck in the 2nd round. 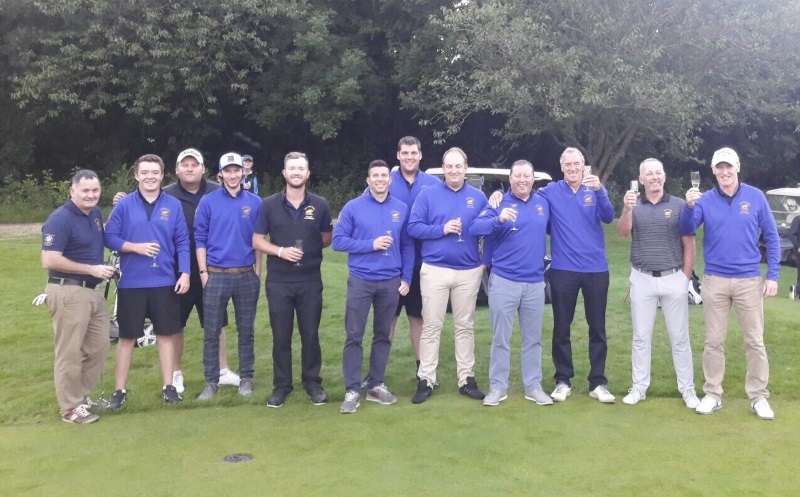 This month sees the start of the Durham County Golf Union and North Durham Golf Union men's events in addition to the Annodata 5 man knock out national competition. Next Saturday (7th April) Jonathan Gowland and Jeff Willey compete against Whickham in the 1st round of the Inter County scratch foursomes at Whitburn whilst next Sunday (8th April) at Brancepeth Kevin Pedley, Glen Burdess, James Luke, Vigan Qehaja and John Hepple represent the club against Alston GC in the Annodata - Come along and watch good golf - your support would be much appreciated. On the social side, in addition to the hugely successful quizzes, we have held both the Captains Hand Over and Drive-In dinners. They were both well attended, really enjoyable occasions with excellent food being served in a relaxed atmosphere. A reminder Quiz this Saturday Night at 7pm. Lasagne for supper. With regards to the Captains Drive-In, many thanks to those members, friends and family who on the lunchtime (in waterproofs and with umbrella's !) supported the ceremonial Captain's drives from the 1st tee - both of which would undoubtedly have been 100yds longer if it wasn't for the wet conditions ! Good luck also from everyone at the club to Senior's Captain Will Cowan at his respective Drive-In on the morning of Thursday 5th April. Turning to course conditions it is pleasing to hear so many positive comments by members recently regarding the presentation of the course. The results of the efforts of all the Greens Staff over the winter are currently there for us to see with tees and greens especially looking good despite the weather! As all members will have hopefully noticed the construction of the new practice putting green is well underway and coming along very nicely with seeding due to be done in the next few weeks. This will no doubt be a great facility and (again heavily weather dependent) might see us all practicing our putting by the end of the season. Thanks to Trish and the Bar / Catering Team for their efforts over the winter months. Vice-Captain Peter Burdess and his wife Liz recently had a Sunday lunch at the club and were extremely complimentary about their meal (and we all know how much Peter enjoys his food !) so there's a good recommendation for you. 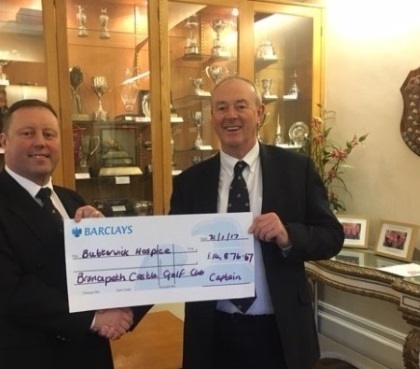 Quick Captains Charity update - currently over £800 raised for St Cuthbert's Hospice Durham - fantastic effort, especially as it’s still early in the year, so please everyone let’s keep it going ! See you either on the course or in the clubhouse. I just wanted to let you all know that our Coffee Morning on Friday 16th March was a huge success. We made a fantastic amount of £785!! You really are a great group of ladies and I must thank you so much for your kind donations. The cake and savoury table was once again a big attraction and did very well indeed. Mary Berry, 'eat your heart out'! The Tombola is always a popular stall and the raffle exceeded all our expectations! Guess the number of golf balls went down well and I was delighted to present Elaine Mitchel with the basket of fruit for picking 167 as the winning number. The atmosphere was excellent throughout the morning and so many guests said they had truly enjoyed there time with us at Brancepeth. I must once again thank my committee for their hard work and to all volunteers from our section who helped on the stalls. All we need now 'girls' is an improvement in the weather and the chance to play the game we all love!! Playing at Brancepeth Castle in the first round of the 2018 Daily Mail Foursomes, Marianne Moore and Helen Morgan beat the team from Crook Golf Club by 7 & 5. 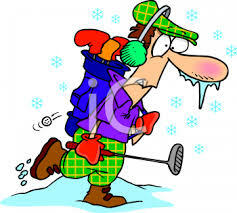 The match was played in very poor conditions with snow and ice on the course but our Ladies were up to the challenge and now go on to meet Ramside in the next round. 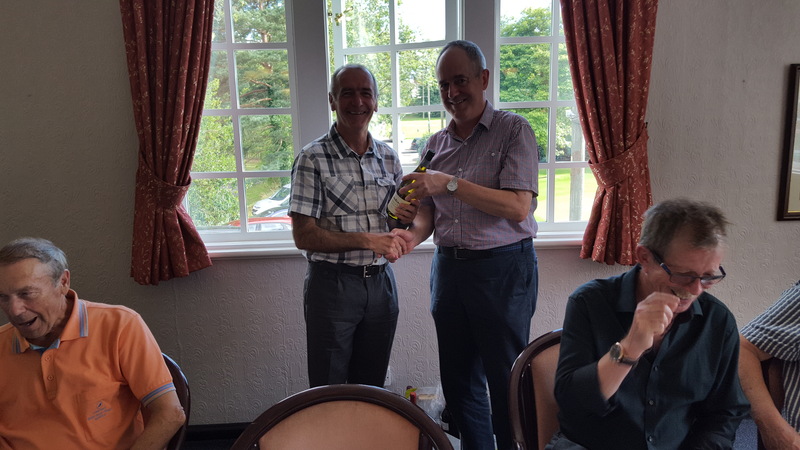 Mal Fawcett handed over the Captaincy to David Tweddle. Many Thanks to all who attended the Captains Handover Dinner. Thanks to Trisha and all the Staff for their efforts. 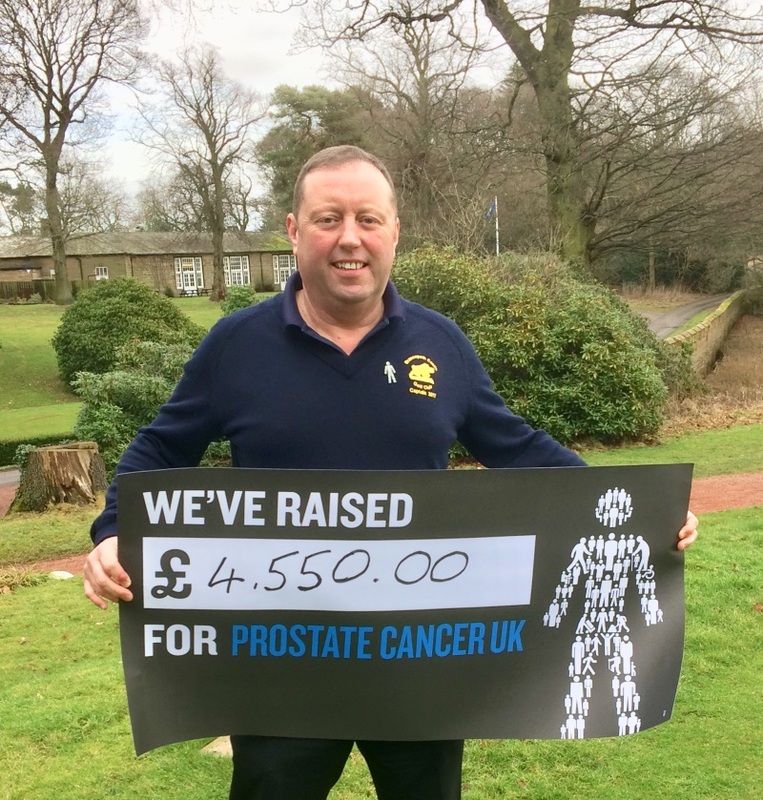 The total amount you helped to raise in aid of my chosen Charity in 2017, Prostate Cancer, is a fantastic £4,550.00. Sincere thanks to all who supported this great cause - through kind donations, sponsored events, buying raffle tickets, etc. Please note that the courses participating in the Harry Colt Reciprocal Fees Scheme has been updated for 2018. Click here to see this list and further offers for Members. I am delighted to say my first official duty as Lady Captain was to hold a small birthday celebration for a very dear member, Eleanor Elliott. Believe it or not Eleanor was 80 years old this week, so there was no way our Ladies Section could let this go without having ' a bit of a do'! Eleanor has been a loyal member of Brancepeth for 30 years and she was Lady Captain in 2004. I would like to thank Pat Simpson and Carol Rae for providing a beautiful cake for the occasion and the Ladies Section for supplying a glass of fizz to all the ladies, who I must say, came out in force to support a lovely event for a lovely lady! Here's to more fun over the coming year! My very best wishes to you and your family for the New Year. It is an absolute honour and privilege to represent Brancepeth Castle Golf Club as your Captain for 2018. I am really looking forward to meeting you all both on the golf course, in and around the clubhouse and at the various social events during the year. The season will officially begin with the Captain's Drive-In on Saturday 31st March 2018. I thank Peter Burdess for accepting the position as Vice Captain - with his support I look forward to the year ahead and I would also like to wish Lady Captain Marianne Moore and Senior Captain Will Cowan and their respective Vice Captain's, Julie Rose and Paul Smith, every success for 2018. My chosen charity for 2018 is St Cuthbert's Hospice, Durham City. I am profoundly aware of how the charity has assisted many of our members families over the last 30 years and having recently met with their fundraising team I know how appreciative they are at being the chosen charity. Your support in raising funds during the forthcoming year will be greatly appreciated. In many ways 2017 has been a most successful year for the club both on and off the course. I would like to thank out going Captain's Malcolm Fawcett, Lyn Davison and Peter Robson for their enthusiasm, effort and commitment over the year. In addition sincere thanks to all the club staff and members of the various committees who continue to do excellent work for our club. Wishing each one of you an enjoyable and successful golfing year. The WAGS held their Annual Christmas Competition for the Mike Atkinson Trophy on Wednesday 13th December 2017. The photograph shows the Vice-Captain, David Tweddle, handing over to the trophy to the winners, Dave Morgan, Tony Myers and Les Oliver. The Seniors held their Annual General Meeting in the Clubhouse on Thursday 7th December 2017. At the meeting, Paul Smith was confirmed as the Senior's Vice-Captain, Terry Dithburn as Treasurer and Geoff Pennington was re-elected as Secretary. 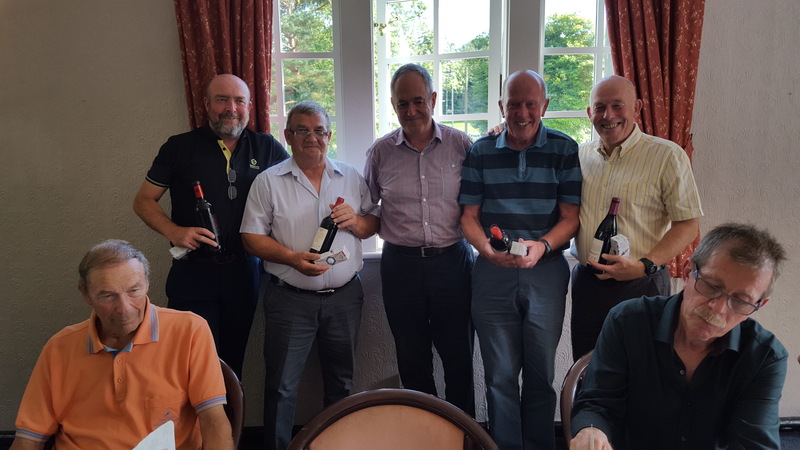 The AGM was preceded by a Team Competition which was won by Tony Lofthouse, Ian Hughes, Bill Cooper and Mike Goodwin. In second place were Keith Cresswell, Granville Fowler and Henry Barry. All players then enjoyed an excellent Christmas Lunch held in the dining room. The photograph shows the outgoing Captain, Peter Robson, handing over to the 2018 Captain, Will Cowan. The membership fee is only £15 and is open to any male member of the club who is aged 55 and over. So if you would like to join, please come along and you will be made very welcome. 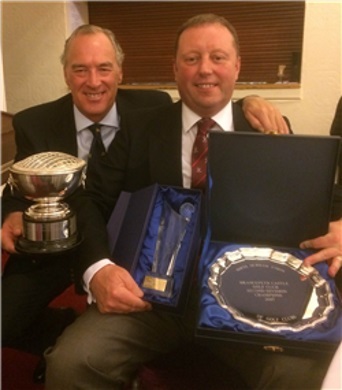 The photographs below show Captain Mal Fawcett and Vice-Captain David Tweddle being presented with the North Durham Union of Golf Clubs 2nd Division Champions Trophy. Will all members please note that Winter Rules now apply from 1st November 2017 until 31st March 2018, unless removed by the Head Greenkeeper. Click on the image for a reminder of these rules. Note, in particular, when using trolleys or buggies that you obey all signs, white lines and fenced off areas put in place by the Greens Staff to avoid damage to the course. DO NOT take trolleys around the fringes of the greens. Please enjoy the course throughout the winter months and by looking after it in this way will mean we will have an even better course next year. Left to right: J Rose, C Rae, A Charlesworth, P Cooper, M Moore (Team Captain), R Preston, L Davison (Lady Captain), J Dixon, H Morgan and D Simpson. Team players not present: J Doughty, Y Dunbar and C Van Buuren. B Team who finished 3rd in Division 2. Left to right: H Morgan, S Noke, A Charlesworth (Team Captain), P Cooper, E Mitchell, B Parkin, L Davison (Lady Captain), E Wood, M Wigham, J Dixon, J Atkinson, D Simpson, J Dickinson and T Smith. Team players not present: S Farrell and C Van Buuren. Sivewright Team who finished 3rd in Sivewright South Division 2. Left to right: E Wood, M Wigham, L Davison (Lady Captain), B Parkin, J Dickinson, A Rowbotham, K Cleasby, T Smith, M Thompson (Team Captain) and C Hutchinson. Team players not present: E Robinson, J Kelly and M Goodyear. On one of the warmest and sunniest days of the season, despite heavy overnight rain, the biannual Ladies and Seniors competition was held on Thursday 28th September 2017. 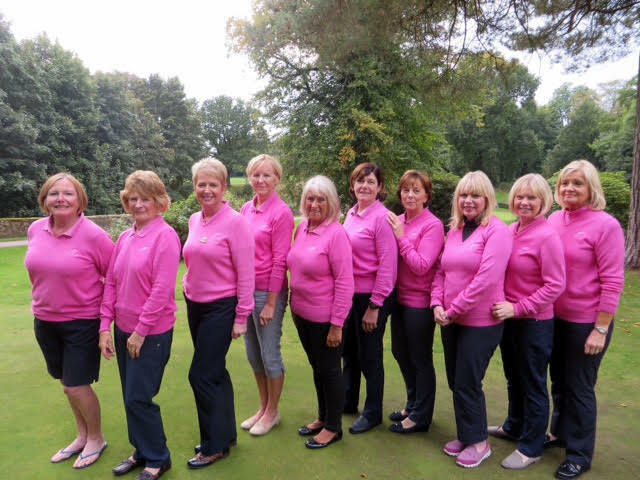 Eight teams, each consisting of two Ladies and two Seniors, played a stableford competition with the best Ladies and best Seniors score counting towards the team total. 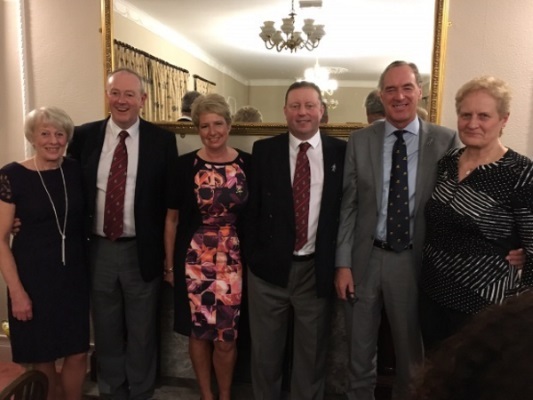 They were joined by guests Vice-Captain, David Tweddle, and Jack Nicklaus, in the guise of Deborah Simpson, who played for the Seniors to even out the numbers. In first place with 80 points, were the odds on favourites Lady Captain Lyn Davison, Lady Vice-Captain Marianne Moore, Seniors Vice-Captain Will Cowan and David Tweddle. In second place with 72 points were Norma Hardy, Carol Rae, Terry Ditchburn and Jeff Foster. In third place, on count back with 71 points, were Jean Atkinson, Marlene Barton, Ray Crowle and Charlie Mitchell. 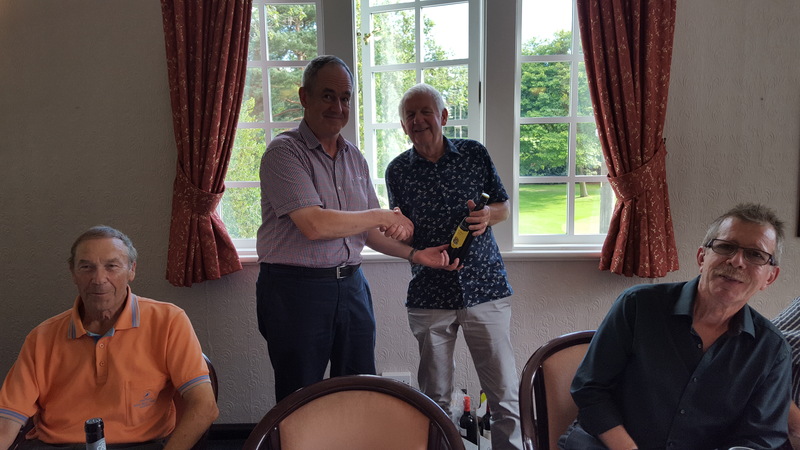 Keith Cresswell won the nearest the pin competition at the 15th hole and Mike Goodwin had the straightest drive on the 17th hole. Following the game, everyone enjoyed an excellent meal in the clubhouse. 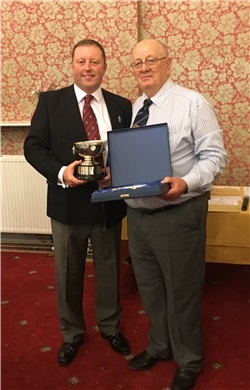 The Seniors Section held their annual competition for the Tom Shepherd Cup on Tuesday 19th September 2017. After so many wet Tuesdays, for once the weather remained dry and reasonably warm. 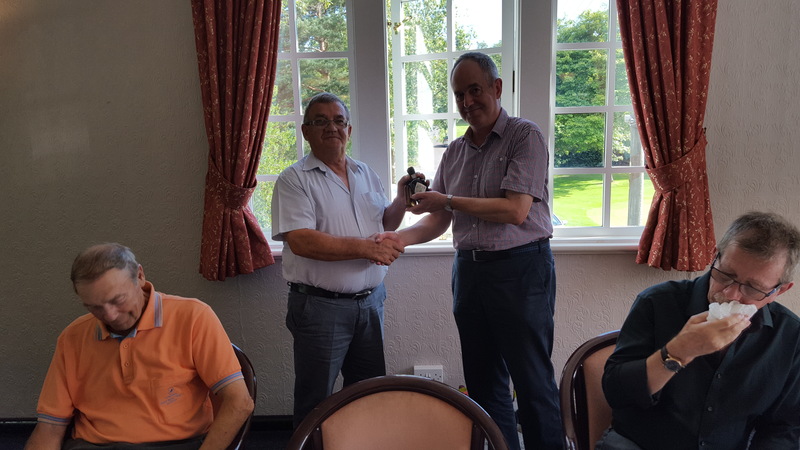 The winner was Ian Hughes with 36 stableford points and is shown here being presented with the trophy by the Seniors Captain, Peter Robson. In a close contest, Graham Jackson finished second with 35 points and Les Dunbar third with 34 points. Kevin Jackson finished nearest the pin at the 9th hole while Graham Jackson was nearest at the 15th. The Doreen Wallace Mixed Greensomes was held on Monday, 28th August 2017. 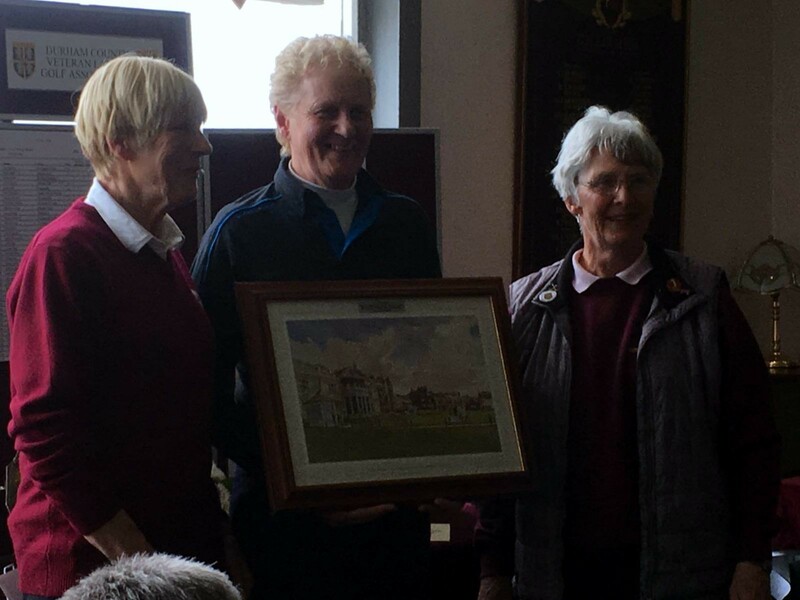 The winners were David and Helen Morgan with 38 stableford points and are shown here being presented with the trophy by Doreen herself and Lady Captain, Lyn Davison. 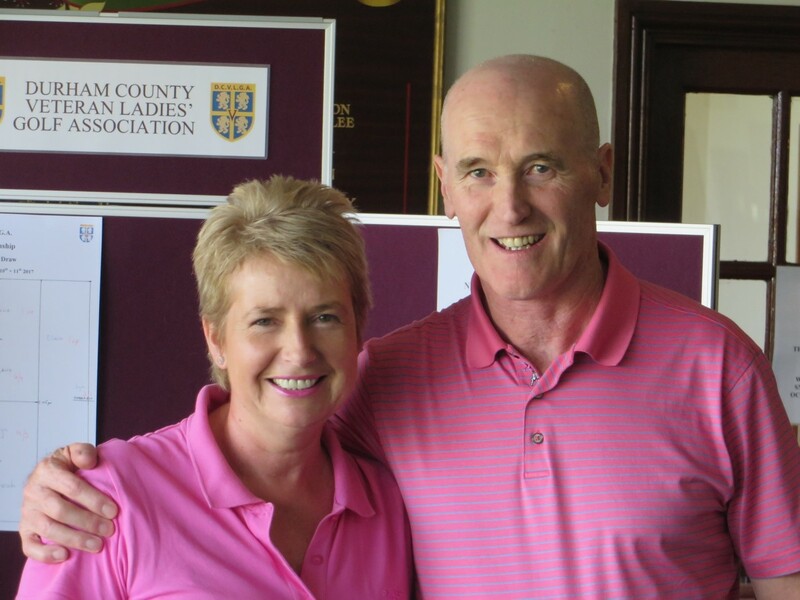 Jim and Sheena Murray finished second with 37 points and Will Cowen and Jane Moore were third with 36 points. On Thursday 24th August 2017, the annual competition for the Ladies Past Captain's Cup was held. 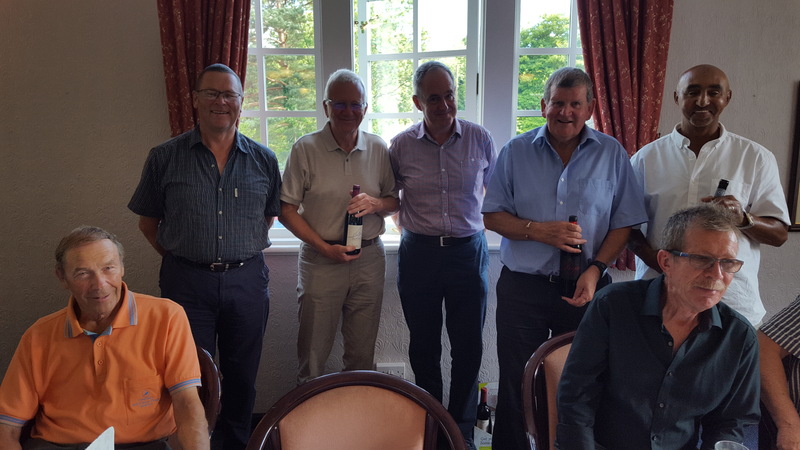 It was a dry, sunny day which was perfect golfing weather for the 11 Past Captains who were available to play on the day, along with this year's Lady Captain, Lyn Davison, who is invited to play (but cannot win!). This was in sharp contrast to last year's weather, when due to very wet conditions, the stableford competition had to be played over just 9 holes. Congratulations to Linda Larnach who was this year's winner. Afterwards, those who had played were joined by five more Past Captains for a meal in the dining room. The David Hay Mixed Greensomes was held on Saturday, 19th August 2017 in bright but very windy conditions. 16 couples took part in a very close competition with only 7 points separating the field. 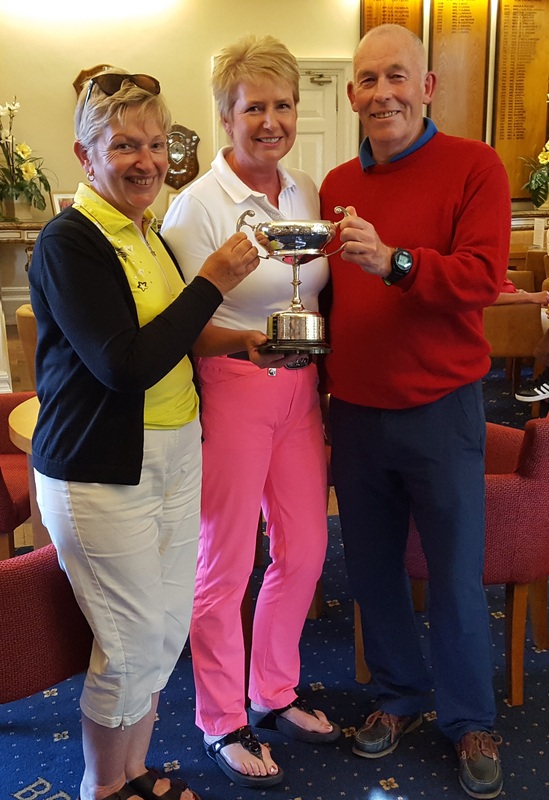 The winners, with 32 points, were Geoff Pennington and Norma Hardy shown, here being presented with the trophy by our Lady Captain, Lyn Davison. 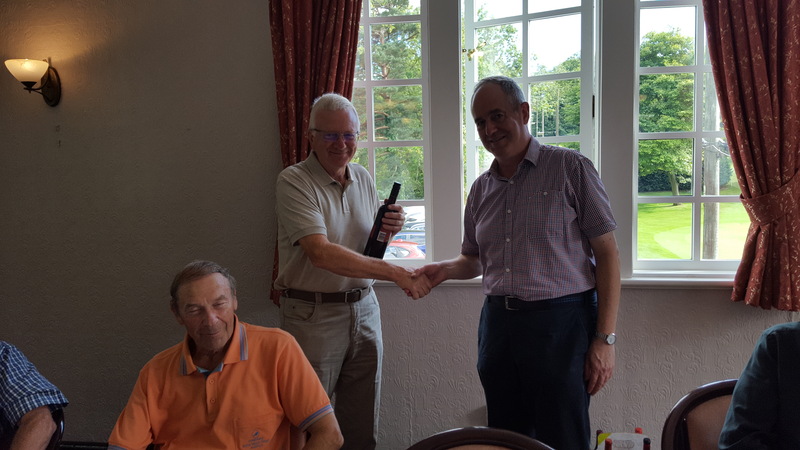 Neil Tiplady and Barbara Parkin were second, with Eric Rix and Elizabeth Wood third, both teams also scoring 32 points, with the positions being resolved on countback. On the 18th August, Brancepeth Ladies went to Ponteland for an Away Day organised by the Past Captain. It was a bright but breezy day with only one heavy downpour, which some lucky ladies managed to avoid. Everyone enjoyed the course very much and found it a much easier walk than Brancepeth. The Quaich Cup, presented by Mrs Sheila Craggs in 1995, is awarded to the winner of this stableford competition. Our Lady Captain, Lyn Davison was the winner of the Quaich Cup this year, Ann Charlesworth came 2nd and Jill Dickinson was 3rd. The meal in the clubhouse afterwards was very good indeed and finished off a perfect day. 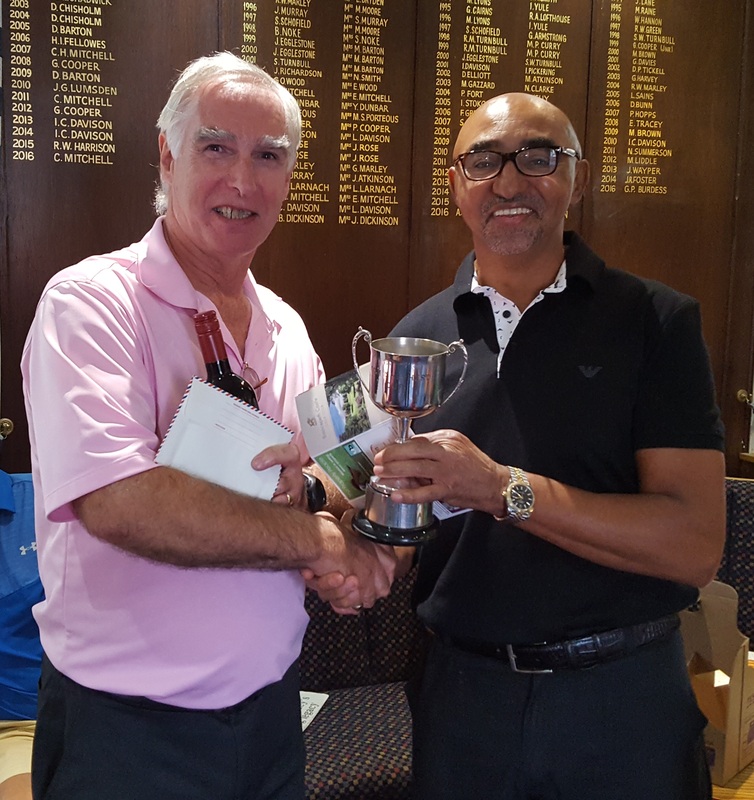 "It gives me great pleasure to announce the results from the 36 hole club championship held on Sunday 6th August 2017. Congratulations to all who took place on this special date in our fixtures, it is in an achievement to play 36 holes but, I feel, very worthwhile. 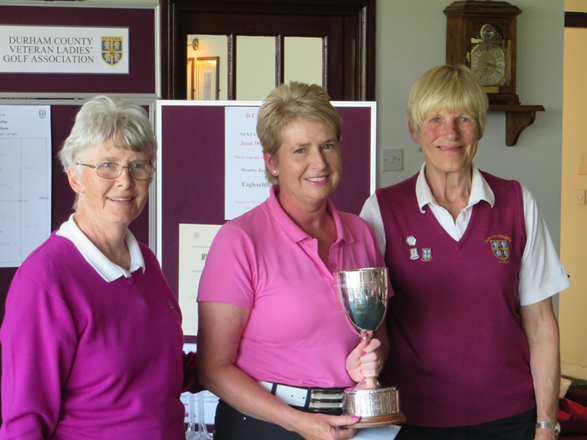 The bronze championship gross trophy was won by Diane Smart and the nett by Avril Rowbotham. Well done ladies. 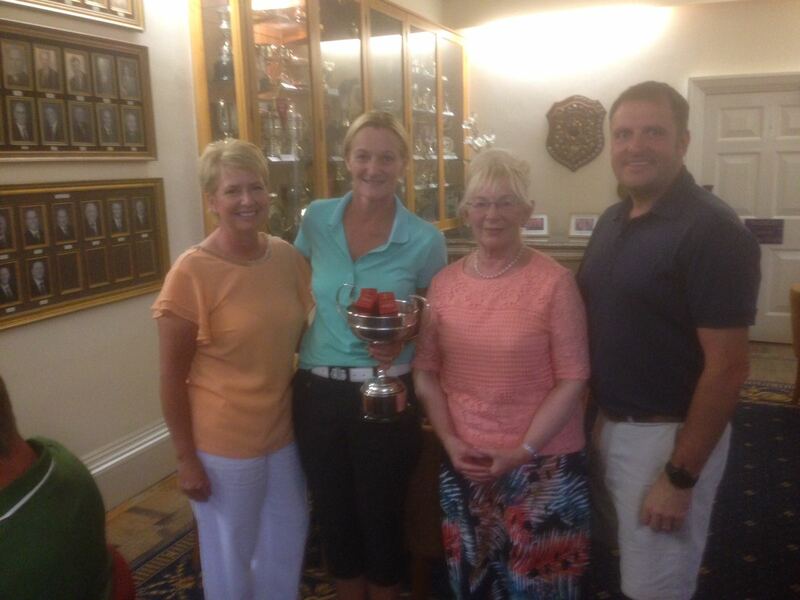 Over the long course the Anson Gibson Trophy 36 hole nett championship was won by Deborah Simpson, well done. And our Club Champion for 2017 is Marianne Moore, with rounds of 76 and 83. Absolutely fantastic 1st round, with birdies on 8, 9, 10 & 11. Superb golf, congratulations Marianne." What a tremendous result on Tuesday 1st August to end the season: 10-4 win at home against Houghton. It has been an absolute pleasure for me as Captain to manage a great group of guys who have on a weekly basis played some fantastic golf, their commitment evident in our end of season results. Not only have we topped League 2 we are back where we belong - League 1. Sincere thanks to each and every one of you who has played a part in the well deserved success we have achieved - players, caddies and supporters alike. Many thanks to Vice Captain David Tweddle for your continued support. I am a very happy and proud Captain. 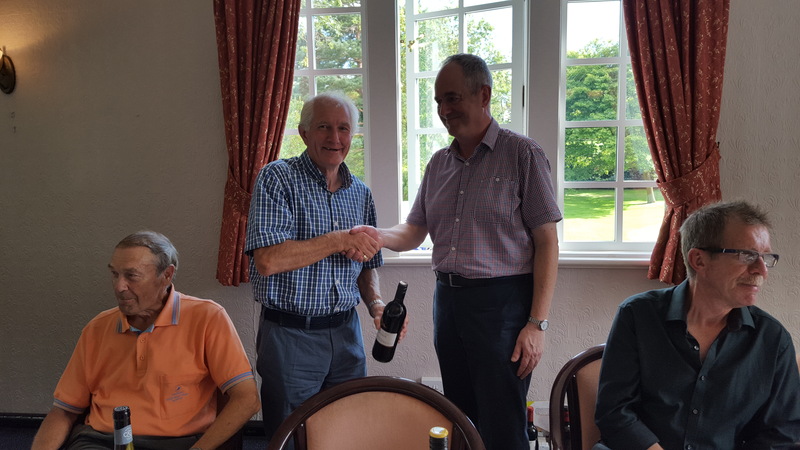 Past Captain's Day - 2017 The annual Past Captains Day was held on Sunday, 30th July. 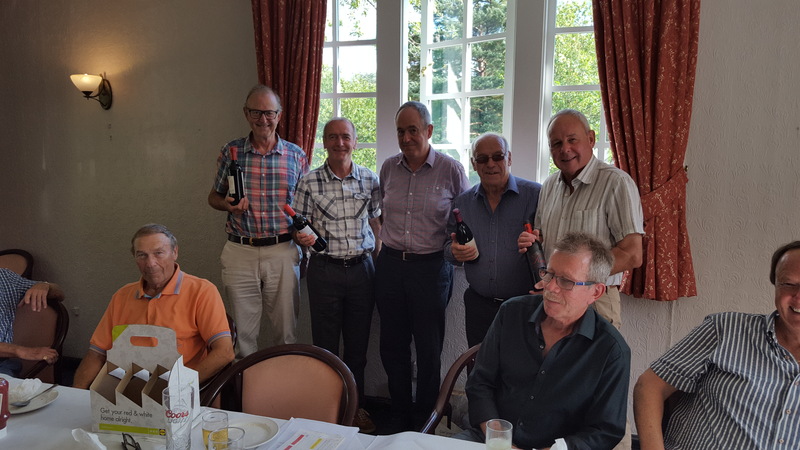 Fifteen past captains played in a singles stableford competition and were later joined by John Pennington, who initiated this competition in 1989, and the present captain, Mal Fawcett, for a meal afterwards. Charlie Mitchell won the trophy with 36 points with Tony Myers second on 33 points. One of the pictures below shows Mal presenting Charlie with the trophy, a crystal port decanter which is then filled and passed round the company. The Past-Captains would like to thank Trish and her team for looking after us so well. The Lady Captain, Lyn, thanks all members who contributed to the Ladies Breast Cancer Charity Day on Tuesday 25th July for their generous donations and contributions..
At present £600 has been raised from the sale of tea, coffee, cakes and scones, which were all kindly donated, from the raffle and from the entries to the Pink Ball Competition. It was a great day and your support for this very worthwhile charity is very much appreciated. The winners of the Pink Ball competition were Marie Thompson, Yvonne Dunbar and Jennifer Dixon. Second were Helen Morgan, Ann Charlesworth and Deborah Simpson. 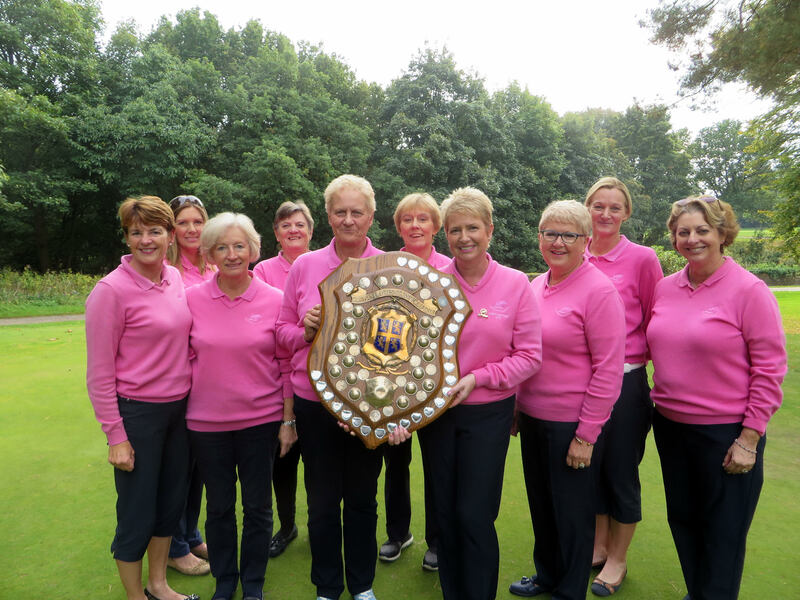 Congratulations to our Ladies A Team who halved their final match away to Tyneside on 24th July. Once again they have completed the season unbeaten and have now won the league for the 6th consecutive year. Just a short note to express my sincere thanks to everyone who played a part in making my Captain's Day a special one - truly a day to remember. I am overwhelmed by all your well wishes and generosity in support of the Tombola / evening raffle and auction as well as my chosen charity Prostate Cancer - final figure £995. Brilliant! I hope you all enjoyed the day as much as I did - thank you each and everyone of you. Below are a few photos of the day. This year, four Brancepeth Ladies have qualified to play in the Durham County Vets team. During the season they play against Vets teams from Northumberland, Cheshire, Lancashire, Yorkshire and Cumbria. Lyn, our Lady Captain and Vets champion, leads the team out in the opening match against the champion of each county. 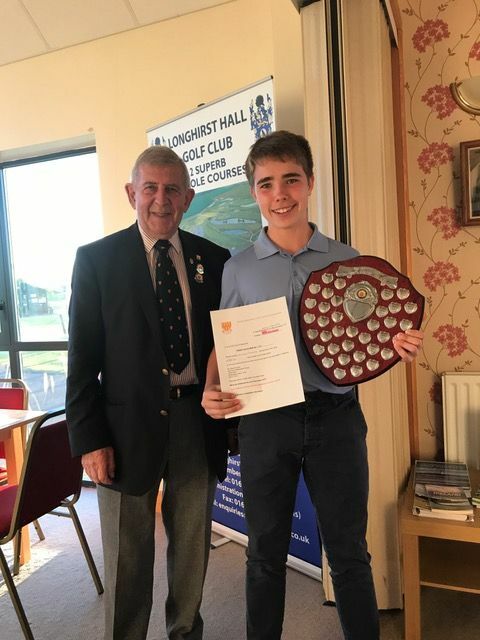 Owen Thomas won the Northumberland Junior County Under 18 Stroke Play Championship at Longhirst Hall Golf Club on Sunday 4th June 2017. 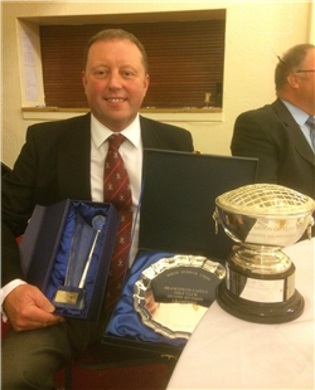 He qualifies as he is also a member of Ponteland GC. He also won the Under 16 age group, but was only allowed to win one event. He just missed out on winnining the Under 21 age group by one shot. He had scores of 76 & 77 against a Par of 73. Click here for the full results of the competition. The Durham County Vets Championships commenced on Monday 8th May at Dinsdale Spa GC, with a qualifying stroke play competition. Marianne Moore won the best gross prize with a superb score of 84 in difficult conditions. Unfortunately, having won the qualifying completion, she was unable to play in the subsequent matchplay competition due work commitments. The following Brancepeth Castle GC Ladies qualified for the matchplay last 16 on Wednesday 10th May: Barbara Cheetham, Lyn Davison, Jennifer Dixon, Julia Doughty and Rosie Preston. The Championship culminated in the matchplay Semis and Final on Thursday 11th May. Lyn Davison won her semi-final against Sarah Hurst of Dinsdale Spa on the 5th extra play-off hole, a superb nail biting 23 holes. In the second semi-final, Rosie Preston lost to Claire Miller of Tyneside GC, who birdied the first extra play-off hole. Well done Rosie, a superb effort! In the Final, on the 17th hole, Lyn got up and down from the green side bunker to win 2 and 1 against Claire Miller. A great win by Lyn which means she has retained the County Vets Championship, which she won in 2016 at Billingham GC. Brilliant Lyn - well done! The biannual Ladies and Seniors competition was held on Tuedsday 11th April 2017. Twelve teams, each consisting of two Ladies and two Seniors, played stableford with the best Ladies and best Seniors score counting towards the team total. In first place, with 75 points, were Marian Goodyear, Jean Atkinson, Jeff Foster and Geoff Raw. In second place with 74 points were the team of Barbra Cheetham, Jennnifer Dixon, Len Stirling and Mike Goodwin . Also with 74 points, but beaten on count-back, were the team of Captains and Vice-Captains, Lyn Davison, Marianne Moore, Peter Robson and Will Cowan. Lyn Davison and Will Cowan had the longest drives at the 17th and in the nearest the pin competition at the 15th hole, Jennifer Dixon was closest. Following the game, everyone enjoyed an excellent meal in the clubhouse. The Ladies' Captain, Lyn and Seniors' Vice-Captain Will, standing in for Captain Peter Robson, who had holiday commitments, thanked all those who participated and wished everyone a happy and successful season. Saturday 1st April at 12 noon saw the official start to the golfing season at Brancepeth with the Captain’s and Lady Captain’s Drive-In, where a large group of members, family and friends turned out to support Mal and Lyn. Mal, in Lyn's words, smoked it 245 yards down the righthand side while Lyn, "with arms like jelly", hit it 212 yards straight down the middle. The “Guess the Yardage Competition” raised £230 for Mal's Charity, Prostate Cancer and £80 for Lyn's Charity, Butterwick Childrens Hospice. Keith Cresswell and Geoff Raw both guessed within a yard of Mal's drive while Ann Charlesworth correctly guessed the exact distance of Lyn’s drive. All three winners very generously donated their winnings to the Charity. In addition to giving a special vote of thanks to their respective Vice-Captains, David Tweddle and Marianne Moore, both Captains would also like to thank everyone who supported the day and the meal in the evening and wish all members a fantastic 2017. The Lady Captain, Lyn, would like to say a huge thank you to everyone who helped out at the Ladies Coffee Morning on Friday 17th March, to all who donated, baked or simply spent money and also to Sheila for the daffodils on the tables. It was a lot of work but was a huge success and we have raised £841. Click here to view a copy of the latest Agronomist's Report. "Golfers who wheel their trolleys along the narrow route between bunker and green are causing a lot of unnecessary damage and wear. In the best interests of course presentation and maintenance costs, golfers should not take trolleys along such narrow routes when there is ample space to walk and spread the wear outside the bunkers." It is very apparent that many Members still totally ignore this advice. If you want to play your course in the best possible condition, please be careful when using trolleys and buggies. 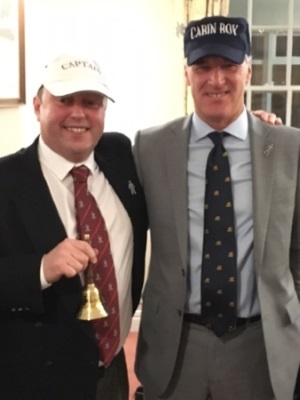 Our Captains, past, present and future, would like to thank the 58 members and guests who attended the Captain's Handover Dinner on Saturday 25th February and made it such a special night. Peter Schofield presented our new Captain, Mal Fawcett, and Vice-Captain, David Tweddle, with golf caps for the occassion and also presented Mal with a Captain's bell for gaining attention. The bell, however, may not be seen much at the Club as Audra, Mal's wife, intends taking it home for her own use! During the speeches, those attending the dinner were made very aware of the danger in confiding anything private to our new Captain. The story of Peter visiting the catering cabin behind the tenth tee and his encounter with a member dog-walking will, however, not be further described here! I have pleasure in attaching a letter and certificate from Sylvia Stoneham, Community Fund Raising Team Leader at Butterwick House, confirming the total raised for 2016 as £14,876.67. 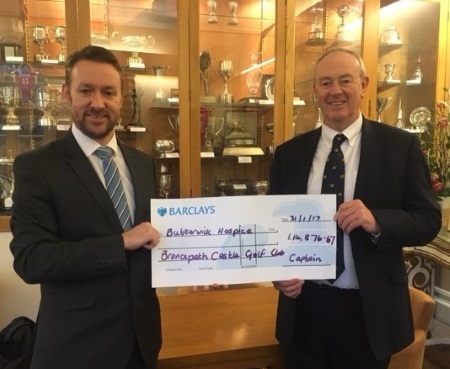 As Directors and Members of Brancepeth Castle Golf Club, I would like to thank you for your tremendous support in achieving this incredible amount. In addition, Mal & I met with Michael Watson of Barclays Bank (who match-funded the Charity Golf Day for up to £1000) for a photo shoot. These photos, shown below, will be distributed throughout the Bank's PR machine and hopefully appear in various magazines produced by Barclays. I also visited Butterwick House at North Tees Hospital last week, again photos were taken for their in-house publication. Hopefully this will give the Golf Club good exposure.